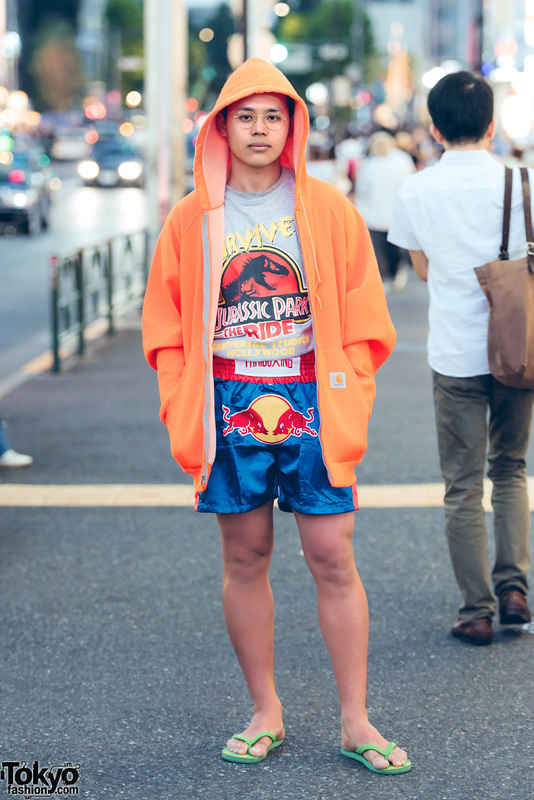 Harajuku guy in casual streetwear outfit with hoodie jacket over a Jurassic t-shirt, satin boxing shorts, and flip flops bought in Thailand. Harajuku duo sporting stylish casualwear with a band t-shirt, colored denim pants, flip flops, bowler hat and red sling bag; a pinstripe button down shirt, black shorts, sock ankle boots and a round handbag. Harajuku duo in monochrome and floral print fashion styles w/ sweatshirt, tiered skirt, heeled boots, button down shirt, pleated pants, flip flops and accessories. 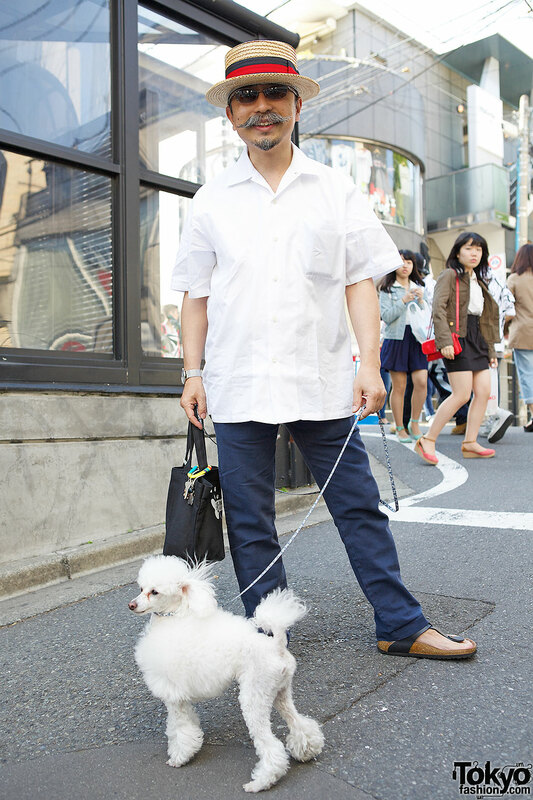 Harajuku gentleman in boater hat, white shirt, navy pants and Birkenstocks with a white toy poodle. Harajuku girl with partially shaved hair and piercings, wearing a floral dress, faux fur capelet and spiked sandals. 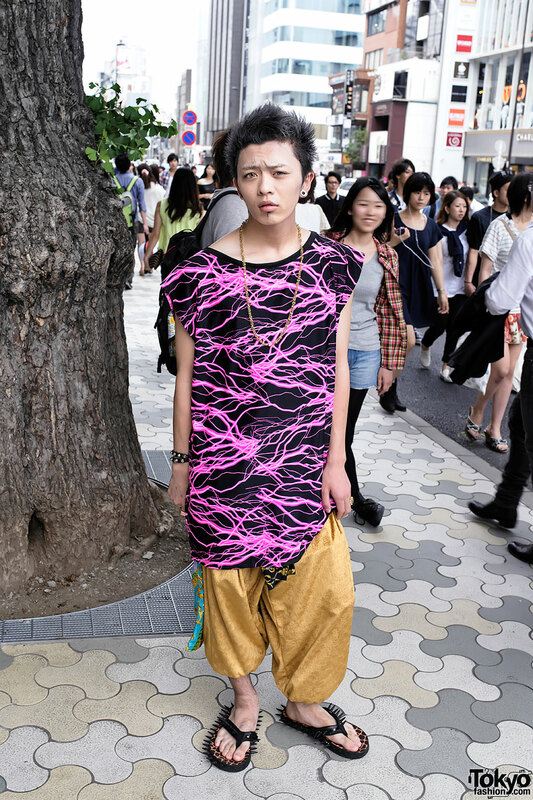 Harajuku guy with a punk attitude and punk-inspired style sporting gauged ears and a labret piercing. Anarchic Mickey Mouse t-shirt with colorful pants and jacket, spiked flip flops and zipper clutch. Fashion designer in flowered Happi coat, Forever21 lace top and skirt from Spank! Student in eclectic look created with resale items and accessories from Bunkaya Zakkaten. Two cool students in bow ties and shirts from Boy and Pingo.